Keith Oliver (Club President) presenting Ravi Marrapu with a Spinnaker Tower fridge magnet to remind him of his visit to Spinnaker Speakers. 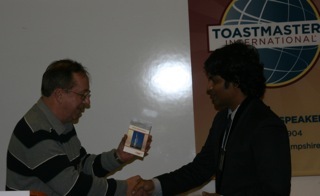 Ravi is a member of ADP Hyderabad Toastmaster's club. At the end of Ravi's visit to Spinnaker, he gave an insightful and inspiring general evaluation of our meeting. Spinnaker Speakers President, Keith Oliver, recently wrote a short article in response to the tragic killings in France. it was picked up by the News and you can read the article in full by clicking on the picture. Spinnaker Speakers Club is proud to be part of Toastmasters International, the worldwide leader in communication and leadership development. Every two minutes a Toastmasters club is meeting somewhere on the planet. 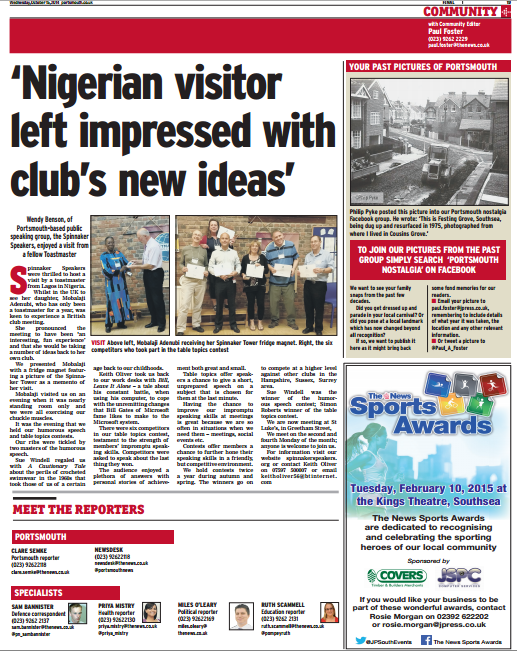 Discover what a Nigerian Toastmaster, visiting Portsmouth, thought of Spinnaker Speakers recent Humorous Speech and Impromptu Speaking contest evening. 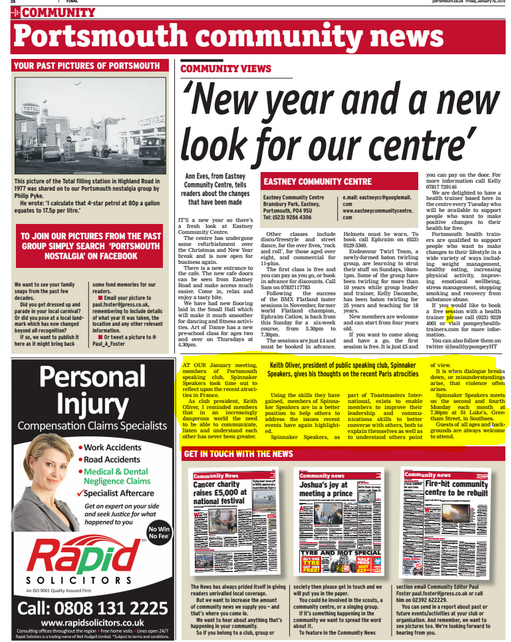 Click on the image or download the full sized article here. 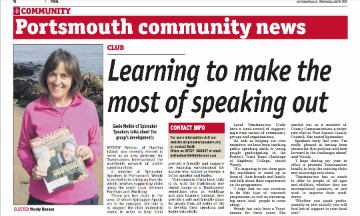 The News can't get enough of Spinnaker Speakers! 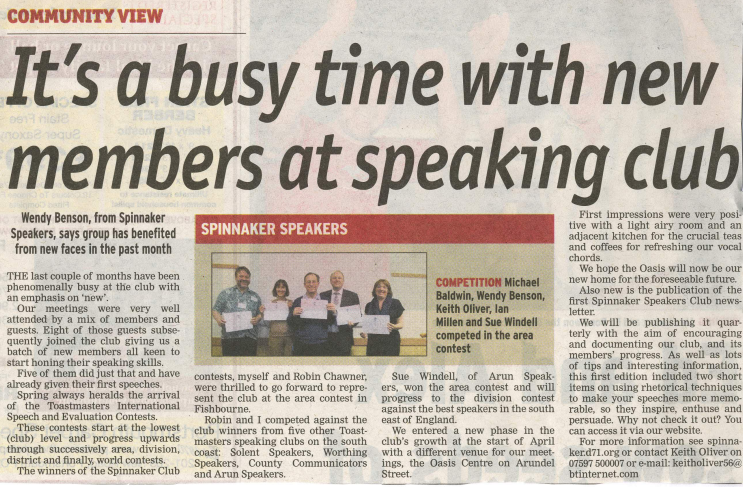 Read the latest article about Spinnaker Speakers Club, Published in the News on 16th May 2014. Has Spinnaker changed your life yet? 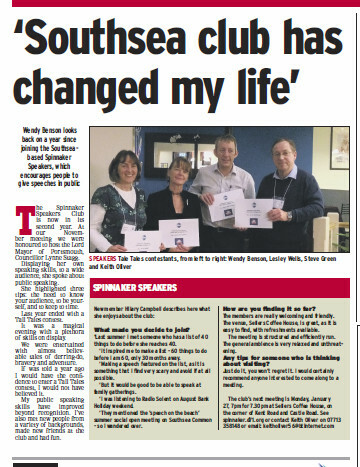 Spinnaker's PR guru Wendy Benson recently appeared on the community page of The News talking about how Spinnaker Speakers had changed her life.